In this vintage of exception, you will find all the fun of the creation. When Clotilde and Nicolas met Nathalie Portejoie, a young contemporary painter from the Medoc, an affinity passed immediately. The two winegrowers were seduced by the style and painting by the artist. Nathalie works with various materials, combining them with happiness in compositions full of freshness and spontaneity. In Nathalies works, watercolor, ink, acrylic, pastel, newspaper clippings mingle in a mix of humour and poetry, to tell stories of people who enjoy life. Drink Champagne, it's to love life! It is therefore natural that Clotilde and Nicolas have chosen to work with the artist to commemorate the birth of twins in the Chauvet family history. 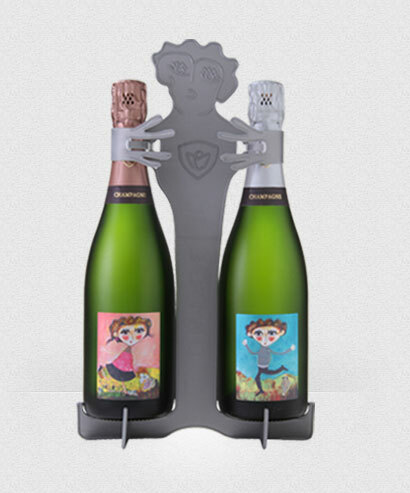 They created the cuvée Duo, dressed by the artist, to present a Champagne of exception. In this extraordinary case, Clotilde and Nicolas offer their unique cuvée "Blanc de Blancs". Blend : 100% Chardonnay, white wine a few months in oak barrels. Year : 2010, 7 years bottle ageing on lees. Visual : let yourself be seduced by the joy, color and joie de vivre that emerges from the labels created by the artist Nathalie Portejoie. Nose : enjoy the woodiness of this Champagne with its delicate aromas enhanced by a few notes of white flowers and vanilla. Mouth : indulge yourself in the fine bubbles that tickle your palate pleasantly and find captivating flavours of wood and vanilla. The surprise is charming: you'll probably be surprised and conquered by this Champagne, delicate and subtle, slightly oaky, with enchanting aromas of vanilla. Our cuvée Duo is like no other!